Published in the South Kent Gazette, 30 January, 1980. 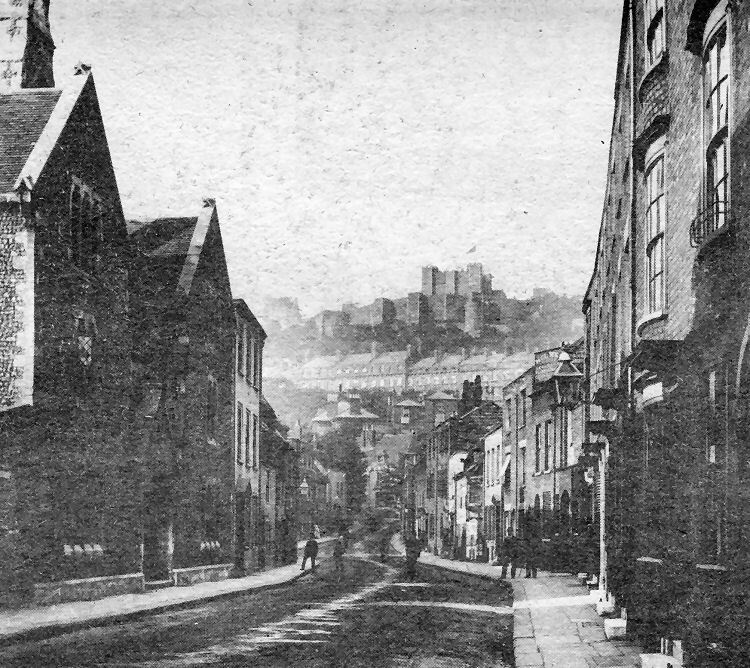 Dover harbour, in Norman times, was under the Castle cliff, where Woolcomlber Street and the Sports Centre stand today. Until the last war the site was a densely populated area, being occupied by houses and businesses not only in Woolcomber street but in Trevanion Street, Trevanion Lane and Woolcomber Lane. All the houses have been swept away by clearance of war-damaged properties and redevelopment. These streets were not ancient, as may be Inferred from their names. One took its name from some houses which were occupied by wool combers, in the 18th Century; and the other from John Trevanion, MP., who had a residence there in the 18th Century. Before going into details of later times, a glimpse of the ancient condition of this triangular area will revive some points of historic interest. When Woolcomber and Trevanion Streets formed the site of the harbour, a branch of the Dour, called East-brook, emptied itself there. That harbour lay without the town wall, and1 was approached through Eastbrook Gate, at a place called Mansfield’s Comer. This place is mentioned in the Corporation records in the reign of Charles I, there being a minute of the Corporation, dated September, 1626, thus: “A watch house with all speed to be made at Mansfield’s Corner, and the market bell hung up there until the fear of danger toe past.“ The name, no doubt, referred to Count Mansfeldt, who came to England in the reign of James I, and raised an army, by permission of that King, for the relief of the Protestants in the Palatinate. Their camp, whilst awaiting embarkation, may have been at that comer. In Woolcomber Street, the oldest house of which there is any record was St James’s Rectory, which stood so near the church as to contract the entrance to Woolcomber Street to a very narrow lane. The Rectory, in the 17th Century, occupied the whole of the west side of the street up to the wall; and, outside the wall, there were no human habitations until a later date. Early In the 17th Century, the wall was broken down, but across the road to the sea there was the moat, which had been constructed for defensive purposes, and over this was built a wooden bridge, continuing the street to the shore. The earliest known Industry In this locality was the making of salt. In the depression left by the old harbour, sea water collected at every tide, and salt being at that time a scarce and valuable commodity, salt-pans were constructed here, by which sea water was evaporated, and salt produced for domestic use. After the salt makers, came the wool combers; and they, in turn, were succeeded by smugglers, who had the hardihood to defy the Royal Customer right under the Castle walls, and to use caves in the cliff to hide their contraband goods. At the corner of Woolcomber Street stood the "Burlington,“ once Dover’s largest hotel. At one time known as the "Hotel Imperial" it was severely damaged by enemy action in the last war and had to be demolished. Opposite was the “Mail Packet“ Inn—a remnant of the time when mail packets landed their passengers in the bay. Between Woolcomber Street and Trevanion Street were Trevanion Lane and Woolcomber Lane. A peep Into these narrow streets afforded traces of the wool combers and the "free traders." Here, too, was St James’s Poorhouse in the 18th Century. On the east side of Woolcomber Street, until the Hitler war devastated the area, were some houses marked Exhibition Place, so named because they were built in 1851, the year of the Great Exhibition in Hyde Park. The wool combers’ dwellings stood there previously. At the bottom of Woolcomber Street was Marine House, which, in 1870, was the home of the Dover School of Art, which had been established a few months earlier at Cambridge House, Custom House Quay, a building better known later as Admiralty House, or the Marine Packet office. At one time it was part of the old "Ship Hotel." Later, the School of Art found a home in Eastbrook Place, Maison Dieu Road (next to No. 9). In 1877 the School moved to Northampton Street; in 1895, to Ladywell and later to Maison Dieu Road. The widening of Woolcomber Street commenced in 1855, when the old Parsonage at its entrance was demolished, and it was continued in 1694, when the residence of Dr Parsons was taken down, as well as the whole of the houses on the western side up to the grounds of the "Burlington Hotel". Another view of St. James’s Street taken about the same time as the photograph which appeared in Part 52 of this series. On the left is St. James’s School and in the distance the "White Horse Inn" (c. 1300). Just beyond the school, with a gas lamp outside, was the old "Bell Inn" with the "Golden Cross Inn" four doors further on. Opposite, with a trader’s sign at roof level, is the works of W. & J. Holmes, plumbers, painters and decorators and signwriters. Nearer the camera on same side were the premises of Mrs Harvey, dressmaker; Frederick Hicks, fly proprietor; J. L Crowe, bootmaker; and J. A. Fenny, engraver. 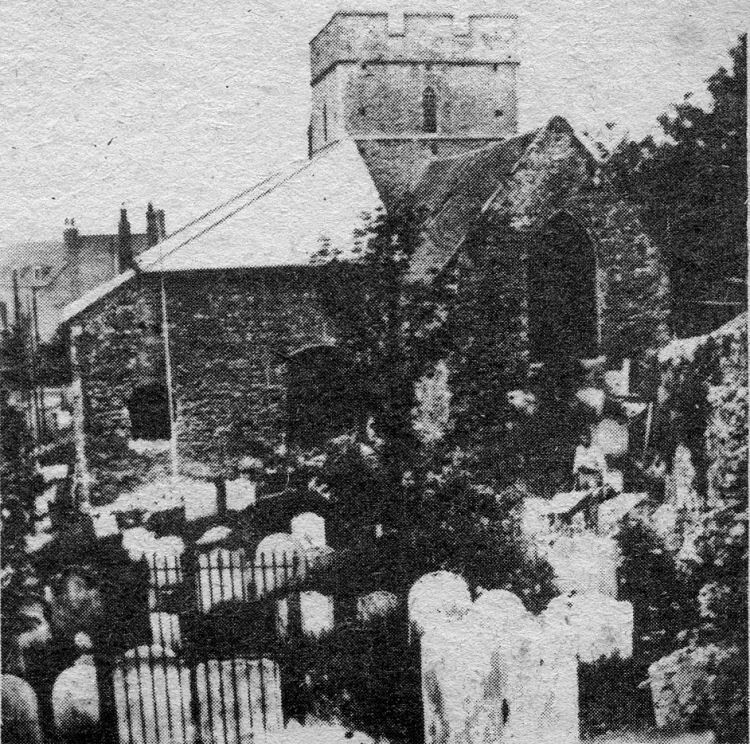 The picture, above, of old St James’s Church was taken a few years earlier probably at the start of restoration work in the late 1860s. In the rear are houses in St. James’s Street which are all that remains of the street today.